Dr. Linthicum is presently the Director of the Center for Medical, Agricultural & Veterinary Entomology, USDA-Agricultural Research Service in Gainesville, Florida USA. He received his BA, MA and PhD degrees in Zoology/Biology from the University of California, Los Angeles, and served as a National Research Council Post-Doctoral Fellow in the Department of Entomology at the Walter Reed Army Institute of Research in Washington DC. He retired from the US Army in 2001. Subsequently, he served as a Supervising Public Health Biologist in the California Department of Health. Since 2004 he has directed a major Agricultural Research Service facility, consisting of 4 research units, employing 60 scientists and 150 support personnel. His scientific interests include vector and disease control, systematics, arbovirology, malaria, rickettsial diseases, and applications of Geographic Information Systems and Remote Sensing to disease surveillance and epidemiology. His research findings have been published in 218 papers in the national and international scientific literature, and presented in more than 370 papers given at national and international scientific meetings. He was the recipient of the John I. Davidson Award for Practical Papers by the American Society for Photogrammetric Engineering and Remote Sensing, the 2010 Federal Laboratory Consortium Lab Director of Year award, a 2013 Finalist for the Samuel J Heyman Service to America Awards National Security and International Affairs Medal, and is the immediate Past-President of the American Mosquito Control Association. 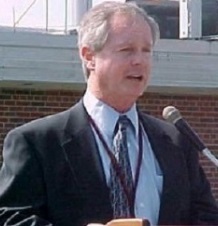 He has served on numerous research and policy review panels dealing with Bioterrorism and vector-borne Infectious Disease topics for organizations such as the World Health Organization, Food and Agriculture Organization, the National Institute of Allergy & Infectious Disease, the Department of Defense, Department of Homeland Security, and the National Academy of Sciences. He has provided consultation for NASA, NOAA, USDA, EPA, National Geographic, Smithsonian Institution, The Bill and Melinda Gates Foundations, The Welcome Trust and numerous universities on issues dealing with surveillance and control of vectors and vector-borne diseases. He has had resident assignments in Brazil, Kenya and Thailand with numerous short-term assignments in Central and South America, Europe, Africa, Asia and Australia.